The thrill of the title chase - and the winter sun in Marbella - seems to have energised Liverpool manager Jurgen Klopp, as he appeared even more exuberant than usual in training on Tuesday. Liverpool are in Spain for a few days training away from the cold owing to the fact they are not in FA Cup action this weekend. Klopp placed himself in the centre of the action, riding into training on a bicycle before getting stuck into the session. Training for Liverpool on Tuesday started with a regular warm up, stretches and core exercises, before they started on their ball-work drills. At the end of the session, some players had a game of foot-tennis. Rather than stand and observe on the sidelines, Liverpool boss Klopp and his assistant Pepijn Lijnders got involved. 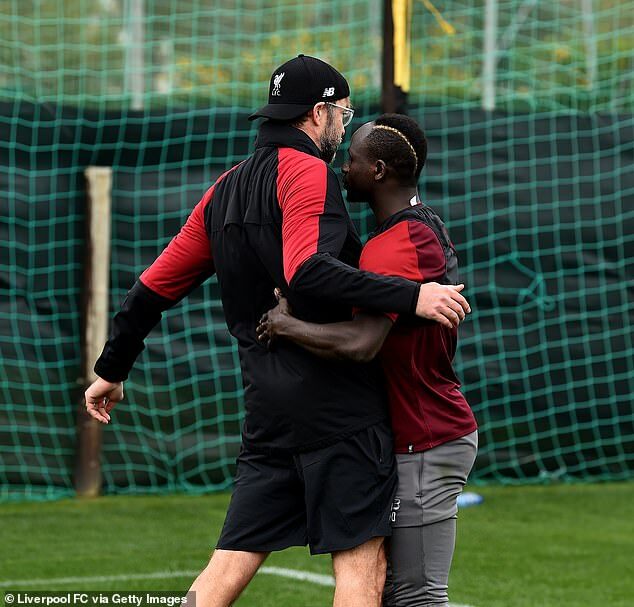 Klopp partnered with Sadio Mane, while Lijnders played alongside Roberto Firmino, and the boss took the chance to show his skills as he flicked the ball up with his heel. 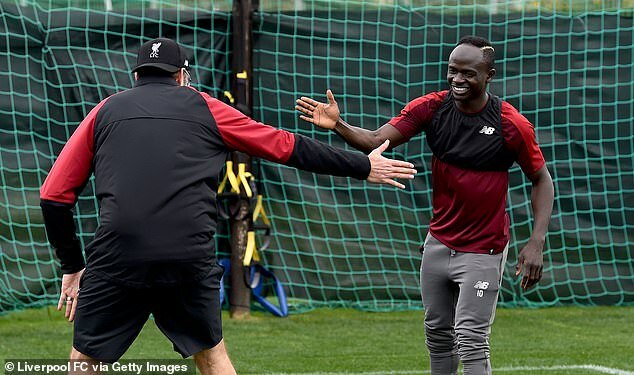 The German manager - who spent his entire playing career as a defender with Mainz - really threw himself into the exercise, and was pictured high-fiving Mane. 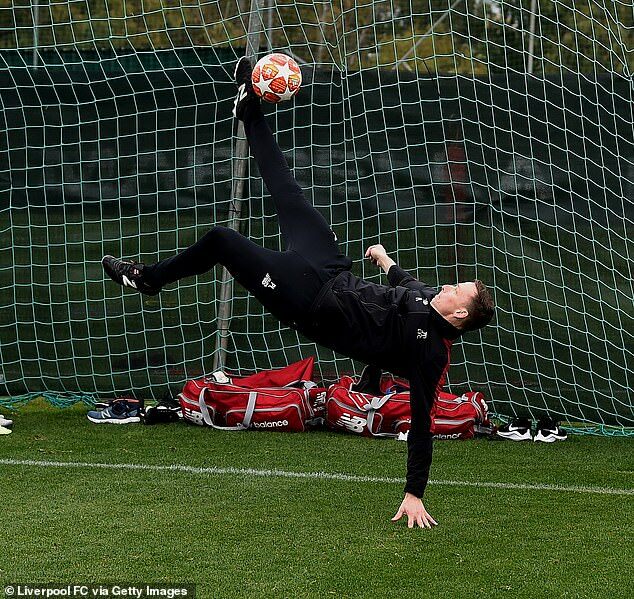 Lijnders was similarly enthusiastic, and was photographed attempting an overhead kick. Meanwhile, Alex Oxlade-Chamberlain stepped up his recovery from a long-term knee injury by joining his team-mates. 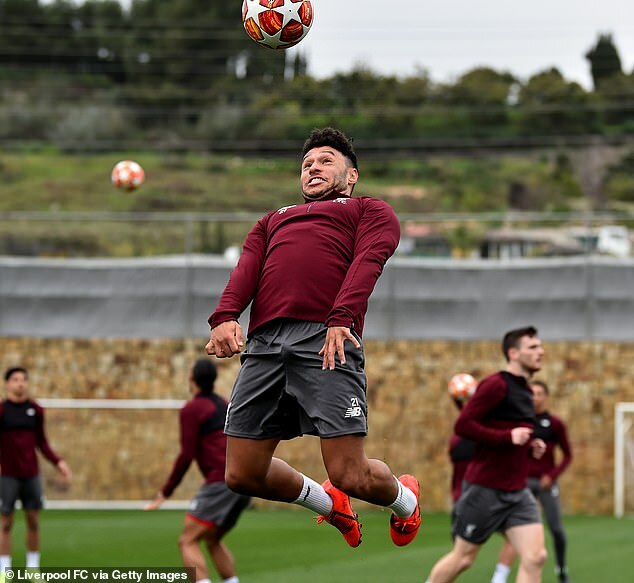 Oxlade-Chamberlain has not played since April 24 when he damaged knee ligaments during Liverpool's 5-2 Champions League semi-final first-leg win over Roma at Anfield. 'The boys had to do a bit of core work, passing and the rondos and it's nice [they could be involved],' he said on the club's website. 'These things Ox can do, and Rhian can do, and Ben can do and Nat Phillips could do most of them. That's all good. 'Dejan is not here and Joe [Gomez] is not here,' Klopp said. 'That's never a good sign, I would say, but we will try everything to make Dejan available for Munich. It will be a tight race. James Milner, Georginio Wijnaldum and Fabinho sat out Monday's session but Klopp said there were no serious issues. 'It's how it is after games, you have a couple of problems,' he said. 'Millie and Gini still struggle with their illnesses, so they did a bit of work in the hotel. Fabinho felt [something] a little bit; it will not be a problem, but there was no reason for him to be out today. In the session, Klopp was also spotted having a chat with Tom Werner, part owner of the football club, who had dropped in during the training session. Werner is a co-founder of Fenway Sports Group - along with John W. Henry - the group which owns Liverpool FC and Major League Baseball franchise Boston Red Sox. Liverpool arrived in Marbella on Monday evening and will remain until Friday, as they have no fixture this weekend. The Reds were knocked out of the FA Cup in the third round by Wolves, which while disappointing for fans does at least give Klopp extra preparation time on the training ground. 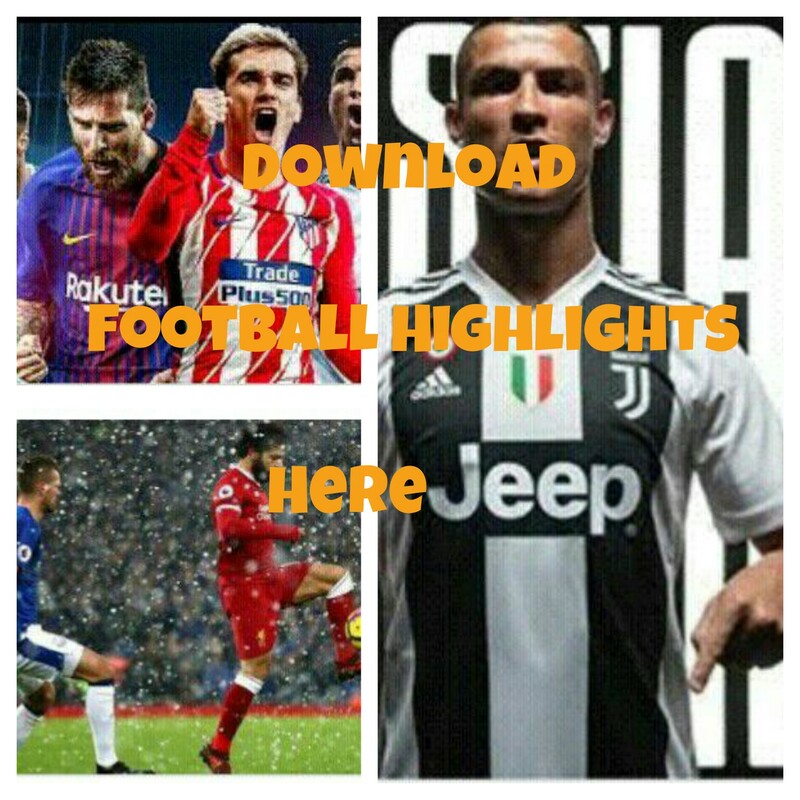 Next week they return to Champions League action against Bayern Munich in the round of 16, while the Premier League title race - against Manchester City and Tottenham Hotspur - is set to go down to the wire.